I first shared these thoughts at Winspiration Day Vancouver 2017, where I was the closing keynote speaker. We all have the power to bring inspiration to our every day; to be inspired and be inspiring – the theme of 2017's Winspiration Day event in Vancouver. 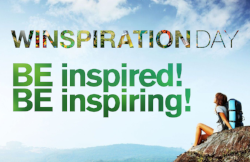 Winspiration Day is an annual, globally celebrated day dedicated to wellness and personal power. Get your tickets for the May 6, 2018 event in Vancouver at winspirationvancouver.com! At the 2017 event, I had the honour of being the closing keynote speaker, where I challenged attendees to capture the inspiring energy shared by the day’s amazing speakers and take it forward. Are you energized to act? By practicing daily rituals – like gratitude, movement and connection – you can stoke your inner fire to keep the flame burning bright, and affect beautiful change in the world! Were you all fired up in January to make this an incredible year? Now, how can you keep the inspiration going? You can choose to stoke the fire by creating energy in your mind, body and spirit! You can create energy by creating rituals. I’m excited to share these 3 daily rituals with you, and hope they’ll give your inner fire some spark! 1. MINDSET: Your mindset is the way you think. Did you know that your brain has an innate negativity bias? That’s right, you’re hardwired to expect the worst, jump to negative conclusions, assume it’s just you, and believe there’s danger lurking around every corner. This is an amazing built-in safety mechanism that we’re lucky to have! I like to think of this inclination as negativity antennae – on high alert to protect us from danger, whether it’s mental, physical or spiritual. However, these robust negativity detectors can take over, making life seem like an overwhelming assault on our mind, body and spirit. What can we do? I believe we’re also born with positivity antennae! For most of us, they’re just little buds we must consciously grow so they’re just as robust as our negative ones. When we choose to grow our positivity antennae, we choose to be open to all the good that surrounds us, so we can be both inspired and inspiring to others. It’s so simple: just think of (or even better, write down) 3 things you’re grateful for every day. Miss a day? Don’t worry about it! Just do the best you can. The ritual of scanning your day for good hardwires this habit and grows your positivity antennae! 2. Movement: Physical activity boosts your brain and body. Did you know that moving your body releases chemicals that improve learning and memory? Amazing! Physical activity also literally stokes your inner fire, by raising your metabolism. MOVEMENT RITUAL: Start your day with movement and weave it throughout (at least every 60 minutes). 3. Connection: are you in alignment? You know that feeling of being in flow? That buoyant energy of inspiration? Of being on a role? Of things going your way? When your deepest inner desires are reflected in your outer actions, you’re in alignment. We’ve all felt the opposite feeling of nonalignment, when we have an ache in our gut or a heaviness in our chest when we’ve done or said something that doesn’t reflect our truest self. When we’re in alignment we feel lifted, expansive and drawn forward. When we’re in nonalignment we feel depressed, contracted and held back. CONNECTION RITUAL: Start your day with the intention to think, speak and act in alignment; and when faced with a decision, ask yourself, is this in alignment with my best, true self?, and listen to the answers that your mind, body and spirit provide. To recap: practice these 3 daily rituals to keep your inner fire stoked and keep the inspiration going! Newer PostBring a friend, share a room, and get 15% off my Hollyhock retreat, June 1-6!